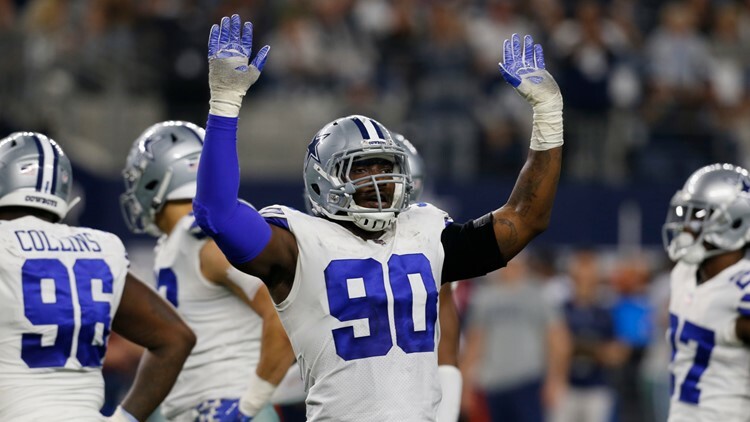 Rumor has it the Cowboys will apply the franchise tag on former Bronco DeMarcus Lawrence again but that should buy them the time they need to work out an extension for their best defender. Feb. 19 marks the first day in the NFL that teams can designate the franchise tag on free agents. In the advent of such a move, news aggregation sites and newsmakers are already saying the Dallas Cowboys will give defensive end DeMarcus Lawrence the franchise tag. First of all, and I hate to be the old man yelling at a cloud, but Cowboys chief operating officer Stephen Jones already stated this was a likely outcome as far back as the first day of Senior Bowl practices on Jan. 22. With a gaggle of reporters, one of them being me, one of our colleagues asked Stephen if the Cowboys were going to use the franchise tag on Lawrence as an extension to work out a long-term deal. "Yeah," Jones said. "That's the only other person we've used the tag on, and we're certainly not done yet. We're not going to not use it. But our goal is to sign him up long-term." The philosophy echoes the approach the club had in the 2015 offseason when it came to tagging receiver Dez Bryant. At that time, I was working with Stephen on a story about what the club was going to do with Bryant as the new league year approached. It was pretty much the same question as was asked at the Senior Bowl: Is the front office using the franchise tag designation as a negotiating extension, not to pass the buck on extending Bryant? Said Stephen on Feb. 28, 2015: "Right. I think that's clear. We just don't want to lose his rights. We think Dez is a, you know, unique player and certainly a big part of what we do in terms of what we've done, our success, and certainly going forward. And you don't want to have that exposure out there, but at the same time we'd love to have a long term deal in place so we don't have to do this in the future." Same thing with Lawrence. The front office knows that the two-time Pro Bowler is critical to their defense, and the franchise tag means they won't be letting anyone else negotiate for his services. So how exactly can the franchise tag be used as a negotiating tool? Firstly, the window to apply franchise or transition tags begins on Feb. 19 and ends at 4:00 p.m. New York Time on March 5. When a player is tagged, it is not until July 15 at 4:00 p.m. New York Time that the team and the tag becomes binding and prevents the two sides from negotiating a long-term deal. Of course, in a situation such as that, it opens up the opportunity for the presumptive tagged player to miss organized team activities and other offseason workouts, as was the case with Bryant in 2015. The Joneses aren't even in the thick of negotiating with Lawrence at the moment. In fact, the Senior Bowl, when they had a chance to meet with Lawrence's agent, is when the talks got started. Now, they will have another opportunity to meet at the NFL combine in Indianapolis at the end of February. All of that sets up for a March 5 deadline of when the Cowboys either get a long-term deal worked out with Lawrence or have to "tag" him officially again. Deadlines make deals at The Star, just as they did at Valley Ranch. The closer a deadline approaches, the more movement there will be. Until then, there is nothing substantive. Do you think that the Cowboys will come up with an extension for DeMarcus Lawrence or do you think they’ll go another year of wait and see with the franchise tag? Share your predictions with Mark on Twitter @therealmarklane.